For some homeschooling families, homeschool testing is required. Highly regulated states may request that a parent provide test scores to prove that a child is proficient in required subject areas. 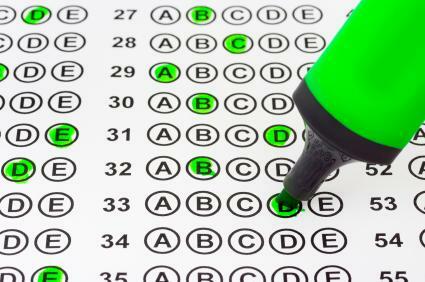 In less regulated states, test scores can be used to show a student's general knowledge and provide qualitative information that can be placed in their permanent record. The purpose of standardized tests is to show how a student's knowledge compares to that of their peers. These tests are required for public school students in most states, due in part to the No Child Left Behind initiative. They are believed to show whether children are learning specific information as well as how well their teachers are teaching it. Those who disagree with the idea of standardized testing, as many homeschooling families do, will agree with Bill Ayers who said, "Standardized tests can't measure initiative, creativity, imagination, conceptual thinking, curiosity, effort, irony, judgment, commitment, nuance, good will, ethical reflection, or a host of other valuable dispositions and attributes. What they can measure and count are isolated skills, specific facts and function, content knowledge, the least interesting and least significant aspects of learning." Luckily, students who are homeschooled do not have to spend endless hours preparing for a homeschool testing program. However, some homeschool families choose to participate in these standardized tests to show that their children are being taught the same information, only differently. Often, they score higher than their traditionally schooled counterparts without having been "taught to the test." This test, also known as CAT, is given each year to California students, starting in kindergarten. The tests vary; depending upon what grade the students are in. For example, kindergarten children are tested on word analysis, vocabulary, comprehension, math concepts and applications. High school seniors are tested on vocabulary, reading comprehension, language mechanics, expression, math abilities, science, social studies, spelling and study skills. The result of the CAT test determines whether a traditionally schooled student is promoted to the next grade level or not. The Stanford Achievement Test is also known as the SAT, not to be confused with the college admission test. This test is used in grades kindergarten through 12th grade. The test utilizes multiple-choice questions to determine a student's knowledge in various areas of academics, such as reading comprehension, math skills and science. This test is now being replaced in many states with those that have been created by their own state's Board of Education. Most states require children to pass these tests before they may be promoted to the next grade level. The Iowa Test of Basic Skills is also known as the ITBS. It is used to test students in kindergarten through 8th grades. This test is a battery exam that tests children in a variety of areas, such as vocabulary, spelling, capitalization, usage and expression, math skills, social studies, science, deciphering maps, reference materials and listening. The ITBS uses a multiple-choice format to determine their skill levels before they may be promoted to the next grade level. The Stanford-Binet Intelligence Scale is considered the forerunner of modern day standardized and achievement testing. This test was created in the early 1900's by researchers Alfred Binet and Theodore Simon who believed that intelligence was constantly evolving in children. Mr. Binet was responsible for the concept of mental age, in contrast to the biological age of a child. A child's mental age (MA) is their development mentally in relation to others of their own age. The Stanford-Binet Intelligence Scale analyze a student's responses in verbal reasoning, quantitative reasoning, abstract and visual reasoning, and short-term memory. While the results of the test are not used to promote children to the next grade level, they may be used to determine whether a student is of average intelligence, below average or gifted. The test score may also be used to gain entrance to certain intellectual groups, such as Mensa and the Triple Nine Society. Homeschool testing isn't necessary unless your state's homeschooling requirements mandate testing. As a parent teaching children at home, you have a good idea of your child's strengths and weaknesses based on the work they produce. Unless they have a twin, there isn't anyone else to compare them to at their own grade level. The only reasons to test your children when they are learning at home is to give them an opportunity to experience testing or to provide test scores to the local school district when required. Most school districts are more than happy to have homeschooled children take standardized tests along with other children at the local school. This helps them determine whether a homeschooled child is learning at a pace consistent with other children in the area. Contact your local school district office if you're interested in supplementing your homeschool testing efforts with standardized tests.